With just under 400 people signed up for the various Dig Deep trail races and a very hot forecast, it was always going to be a steamy few days! 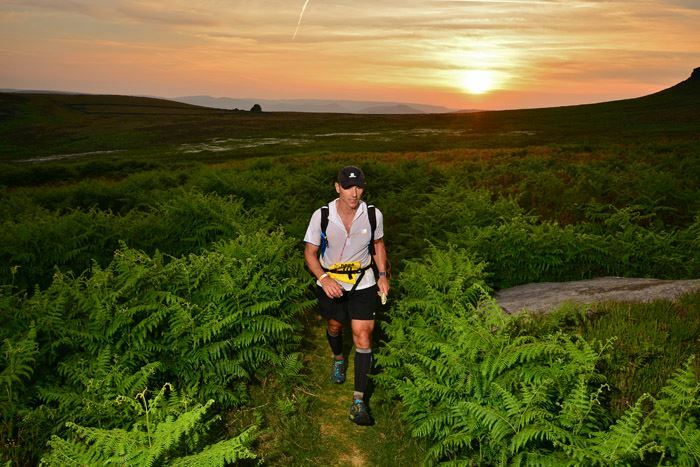 The Mammut Ultra Tour of the Peak District started at 8am – however the temperature was already in the low 70’s (topping 90 – 95 later in the day). Edward Catmur took an early lead and maintained this throughout the race eventually winning in 10.37 which was a fantastic time in the conditions. Equally impressive was 1st lady Zoe salt who also took 2nd place overall in 11.21. The last runners crossed the line at around 5am! Good effort! What was very evident is that the UTPD is not to be under estimated and the brutal conditions combined with what is a very tough course made for a very hard day out for everyone who took part. Well done to everyone who stood on the start line on Saturday morning! The OMM Intro Ultra started just 2 hours later at 10am on Saturday morning and the temperature was now in the mid 80’s. Again, it was all about managing the conditions but there were some impressive and brave performances from many athletes. Michael Sprot won the men’s race in 5.22 and looked remarkably cool at the finish line. In the female race special mention must be given to Pat Goodall who, as an over 50 Veteran female runner, was the first lady back in 6.35. A fantastic race for Pat! Sunday’s Berghaus 12.12 race started in slightly cooler conditions though many of the runners who I spoke to on the first proper climb would have argued that it was plenty warm enough! Steve Franklin won the men’s race with just under 4 minutes to spare on the 2nd place runner Pete Norris in 1:30:32. Rosie Haddock won the women’s race in 1:50:38 with just over 3 minutes to spare on Caroline Richardson. Finally, the Whilrow 10K Trail race was also a hotly (ha, ha) contested race but, by the finish line, Adam Dunajko had over 4 minutes on the 2nd place runner with a time of 41:21. The women’s race was much closer but Justine Head got the fastest female time at 52:08 (winning the over 40 category) whilst Rebecca barker won the senior female race in 1:00:26. Id like to thank all the sponsors of the event as the prizes and support (and freebies) were amazing this year. Outside not only provided retail for the event but they supported us throughout the build up. They are developing their trail running lines in their stores so they are worth a look if you are after some kit! Please use them as without their support we wouldn’t have such a great event. Mammut, OMM and Berghaus supplied us with some amazing prizes so we have to offer a huge thanks to them too. Injinji and CLIF were also amazing with well over £1500 worth of socks and nutrition/hydration handed out as freebies! Dave Taylor, from fell Running Guide, worked tirelessly throughout the event and also supports the races. He also supplies navigation courses so one or two of you might want to give him a call before next year’s race!!! Thanks also to Whirlow Hall farm who allowed us to use their venue! We have raised well over a £1000 just from the 10k income and that figure is rising! Mud Run Results! Fantastic event – well done to everyone who took part!